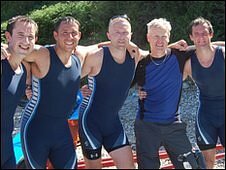 Guernsey's Geomarine went one better than last year as the fours won the 2010 Sark to Jersey race in a time of 1 hour 53 minutes and 37 seconds. Simon Johns, Shaun Kelling, James Couquelin and Tom de Kooker, with cox Lloyd Le Page, came home 26 seconds ahead of FRM from Guernsey. Le Page told BBC Jersey: "I'm so proud of my crew. When they're all recovered, I'm sure they will defend their title." The first Jerseymen home were Paul Coutance and James Salkeld in seventh. Jersey fared better in the ladies section, with the fours of Islands Insurance retaining their title, and were the first ladies to cross the finishing line. That win was all the more impressive as they mis-timed the start of the race and were well back from the fleet when the start cannon went off. Guernsey dominated the top positions with Ian Atkinson, Paul Montague, Barney Lee and Dan Harradine coming in second on their boat FRM, coxed by Jane Menzies. Third place also went to Guernsey, with the pairs of Joseph Paul and Paul Isaacs three minutes further back. The Dominion Jersey fours of Paul Bradbury, Bob Salkeld, Simon Hayward and Guy Hinks, coxed by June Fosse, came home in eighth place.